Dermoid cyst is a cyst located deep to the skin and lined by the skin. It forms either due to accident during antenatal development or even following injury, some skin is being implanted into the subcutaneous tissue. Hence, dermoid cyst can be congenital or accquired. May be noticed at birth, or years later when it gradually distends to a noticable size. The common complaints, usually by the parents is cosmetic disfigurement since it's a swelling at the neck and face. Rarely it becomes large enough to cause mechanical disability or affecting the vision. Congenital dermoid cyst is usually formed when the skin dermatome fuses. It's commonly found at the midline trunk, face and neck, outer or inner aspect of eye brow, or behind the ear. Shape is usually spherical, with diameter of 1-2cm. Congenital dermoid cyst over the face is usually soft. Since it usually doesn't contain clear fluid as it supposed to be (mixture of sebum, sweat and desquamated epithelial cells), it doesn't transilluminate. It fluctuates and if it's large enough, there's fluid thrill as well. Skin over the cyst is pinchable. Local lymph nodes are not enlarged. There's history of old injury, such as deep cut, stab injuries and etc. These implantational dermoid cyst is usually found over areas susceptible to repeated traumas, eg the fingers. Hence, it can be painful, or even interferes with gripping and touch. Seen over sites liable to repeated trauma - beneath skin of fingers. Due to it's small size, it's almost impossible to elicit specific signs for cystic swelling, which is fluctuation and fluid thrill. It's usually hard, and the skin overlying it is usually scarred. The skin is either tethered deep to the scar or within it. It's mobile over the deeper structures, which is usually normal. Commonly confused with sebaceous cyst, but with an old scar and h/o of injury is significant for diagnosis. Throbbing pain which steadily worsens, and keeps patient awaken at night. Patient usually notice a swelling at the site of pain. May complaints of fever with chills and rigor. It may rupture and discharging pus out of the skin before they seek medical attention. The patient may have h/o of diabetes, having debilitating diseases, or even IV drug use. Since the buttocks and upper thigh are usual sites of injection, abscess may be formed there. And in IV drug users, over cubital fossa or groin. Skin over swelling appears red and shinny. Usually started as a patch of induration, which later as pus collects, a spherical mass is formed. There's local rise in temperature. 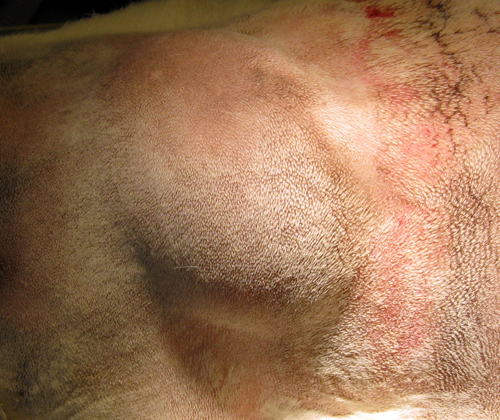 The edge is not palpable since due to the induration and the edema usually fuses with the normal tissue. Initially it feels hard, when pus started to collect, it becomes soft at the centre and fluctuates. Skin over swelling is not pinchable. Our skin is kept oily and soft by secretions of sebum from sebaceous gland. The mouth of the sebaceous glands are located at the hair follicles. Any blockage over these mouth can result in it's distension within it's own secretion and results in formation of sebaceous cyst. Rarely present before adolescence, since it's a slow-growing swelling. Usually seen in young adults or middle-aged individual. It's usually detected incidentally by patients as they're combing their hair, when they complained of scratched lump. It can be infected, where the size suddenly increased rapidly. Sebum secreted from wide punctum can be later hardened to form a sebaceous horn. Skin over swelling is normal unless infected. Shape - spherical, with smooth surface. Temperature is not raised and is not tender unless it gets infected. Edge is easily felt, well-defined. No fluctuations or fluid thrill. As the swelling increases in size, the point of fixation will be drawn inwards and punctum is formed. Punctum is diagnostic for sebaceous cyst, but however, only one-half of such swelling presents with a punctum. Local lymph nodes are not palpable. Lipoma is a slow-growing swelling, rarely regresses. Occurs at any age, but relatively uncommon in children. Not associated with any symptoms, but presents to the doctor usually because they have noticed a lump and wanted to know what it is. Patients can have multiple lipoma (lipomatosis), usually over the neck and buttocks. Common sites of lipoma includes the upper and lower limb, back, buttocks, neck, etc. Size is variable, shape - hemiovoid, spherical, etc. On inspection, surface appears smooth. But when the swelling is palpated carefully, especially when firm pressure is applied, it's lobulated and depression in between these lobulations is seen. There's pseudofluctuation, since it's consistency is soft. However, one will notice that on gentle pressure,the plane of swelling over palpating fingers are not tense or not buldging out. Skin over swelling is pinchable.